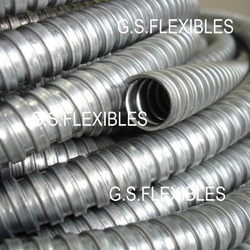 G.S.FLEXIBLES manufactures very Heavy Duty Flexible Conduit. It has excellent crush resistance and offers excellent protection against axial elongation. In all the types, invariably heavy gauge of strip is used making it ideal for industrial and other demanding applications. GSF Metal Flexible Conduit is extremely flexible wiring conduit. Its Square Lock formation allows it to conform to very small bend radius for easy positioning and harnessing. The product is designed to provide protection to power and data cables besides electric wiring in general. Any standard or specialized fittings can be adapted to suit this hose. The fittings can be attached by welding, brazing or using epoxy adhesives. The product is manufactured in Hot-Dipped Galvanized Steel as a standard. It’s also available in Stainless Steel on request. The conduit is furnished without any packing as standard. Cotton packing (sealing gasket) can be inserted to make the conduit dust-proof. It i`s available in all standard sizes from I.D. = ¼ through I.D. = 4. GSF Metal Flexible Conduit is specifically designed for the mechanical protection of wires and cables against industrial abuses. It offers excellent crush resistance and protection against accidental axial elongation. Its smooth interiors, easy installation and cost-effectiveness make it ideal wiring conduit. For sophisticated electronic equipment, please consider our SS Flexible Conduit. Custom sizes and formation types are available upon request.